Even as a new study has said that close to half (48%) the youths of India do not wish to identify themselves with any political party, what should be an eye-opener for the Congress is, while 20% of the Indian youths are “fond of the BJP”, exactly half, 10%, like the Congress. Released early this week, the study has been prepared jointly by the Delhi-based Centre for the Study in Developing Societies (CSDS) and the German Konrad Adenauer Stiftung (KAS). Carried out among 19 states among 6,122 respondents in the age group of 15-34 between April and May, 2016, its survey suggests, with the decline of the Congress, the regional parties, such as AIDMK, DMK, Shiv Sena, Telugu Desam Party, Jharkhand Mukti Morcha, Shiromini Akali Dal, others appear to have gained, with 13% youths “liking” them. The survey finds little support among the youths, just about 4%, among the parties identifies as “socialist”: Janata Dal (United), Janata Dal (Secular), Rashtriya Janata Dal, Indian National Lok Dal, Biju Janata Dal, and Socialist Party. 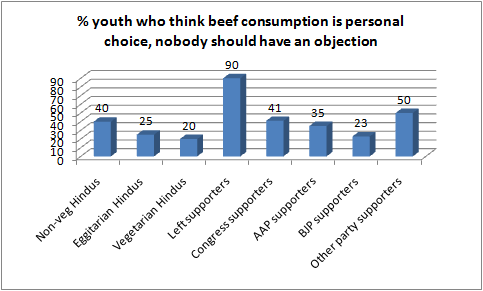 The two Left parties (CPM and CPI) are liked by another 2% of the youths. 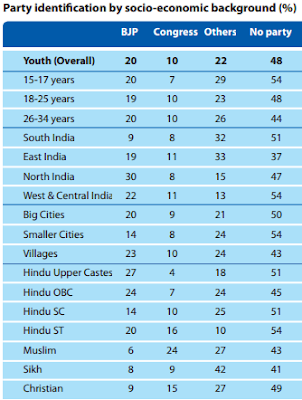 As for the parties such as the Aam Aadmi Party and the Loksatta, whose founding principle was combat youths, they are liked by 2% of the youths, the study, titled “Attitudes, anxieties and aspirations of India’s youth: changing patterns”, says. 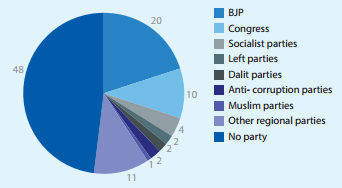 “Close to a quarter of Muslim respondents (24%) said that they supported the Congress party”, the study says, adding, “These are essentially Muslims residing in states which witness a direct competition between the Congress and the BJP”. Ironically, however, the study finds, there was a deceleration in participation in protests among the youth since 2013. It says, in 2011, only 12% youth said that they had taken part in a protest or demonstration. This increased to 24% in 2013, but went down to 15% in 2016.